Almost Ice Road Truckers, except for the tulip bulbs…this is the tale of what happens when a middle-aged mum from England decides to actually drive 18-wheelers across North America instead of just dreaming about it. From early training (when it becomes apparent that negotiating 18 wheels and 13 gears involves slightly more than just learning how to climb in) this rookie overcomes self-doubt, infuriating companions and inconsiderate weather to become a real trucker. Nothing goes well, but that’s why there’s a book. 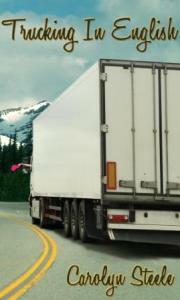 Trucking in English is available through Amazon.com, Amazon UK, and Smashwords. Congratulations to Carol Wyer, the first winner of our weekly 2013 Flash Fiction competition. Thanks also to everyone who participated – excellent entries! It appears that Realfastbooks.com, realfastbook.com, and danielhallpresents.com have been removed from the internet. Whether or not these were scam sites is not up to us to say.